Heat grill. In medium bowl, combine shrimp, lemon juice and oil; toss to coat. Let stand at room temperature for 10 minutes to marinate. Meanwhile, in small bowl, combine mayonnaise, basil and garlic; mix well. Set aside. Cut each roll horizontally into thirds. When ready to grill, place shrimp in grill basket. Place basket on gas grill over medium heat or on charcoal grill 4 to 6 inches from medium coals. Cook 5 to 7 minutes or until shrimp turn pink and opaque, stirring occasionally. Lightly toast cut sides of rolls on grill during last minute of cooking time. Spread half of mayonnaise mixture on bottom sections of rolls. 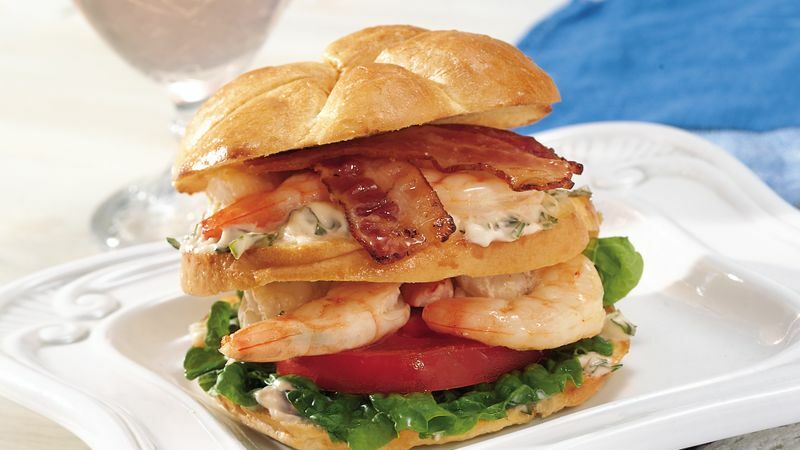 Top with lettuce, tomato and half of cooked shrimp. Place middle sections of rolls over shrimp. Spread with remaining mayonnaise mixture. Top with remaining shrimp, bacon and top section of rolls. If desired, pierce sandwiches in 2 places with long toothpicks; cut in half between toothpicks. To cook shrimp on stove top, cook in medium skillet over medium heat for 2 to 3 minutes or until shrimp turn pink and opaque, stirring occasionally. Toast rolls in oven or toaster. Shrimp of similar size are labeled according to how many make up 1 pound. One pound of medium shrimp will contain between 31 to 35 pieces. Use toasted bread instead of Kaiser rolls; use 3 slices of bread for each sandwich.